The Iranian Ministry of Intelligence and Security (MOIS) and the Islamic Revolutionary Guard Corps (IRGC) both mobilized their cyber armies, both inside and outside Iran, to ramp up a campaign of misinformation against the People’s Mojahedin Organization of Iran (MEK/PMOI), one of the largest resistance groups. The U.S. Secretary of State Mike Pompeo, in a show of support for the Iranian people, asked them to share their questions and hopes for the future of their country on social media. Not surprisingly, the Iranian regime kicked its cyber army into gear, issuing thousands of tweets against the MEK/PMOI and the Iranian resistance. The spike was documented on Thursday afternoon, January 17, through midnight. The tweets and retweets were produced by the regime’s troll factory, which is located in Mashhad, Tabriz, Yazd, and Tehran. There is a reoccurring theme in these tweets, including hashtags that include #Iranians_hate_PMOIand #no_to_Mojahedin_e_khalq. There is also evidence that the campaign used IPs in the U.S. and Europe, to hide to the origin of the tweets. The tweets came under various names, one of the main ones being RESTART. The campaign comes as the regime is struggling to deal with the repercussions of the U.S. withdrawal from the Joint Comprehensive Plan of Action (JCPOA). The Iranian economy is plagued by corruption, leading to an economic crisis marked by high unemployment, currency devaluation, and inflation. It is estimated that 80% of Iranians are living below the poverty line. In spite of this, the regime is determined to project strength, despite the fact that the regime is under siege both domestically and internationally. Ongoing protests against the regime show no signs of slowing. They are not focused on minor problems, but ongoing crises that are both economic and environmental. The founder of RESTART is Mohammad Hosseini and he started with Iranian state-run tv. Later, he joined the Green Movement with ties to Khamenei. In an interview in August 2013, Hosseini acknowledges that he was approached by members of the Iranian Intelligence Ministry and was told to launch a tv program with the content to be provided by the regime. Hosseini indicated that he had been threatened, including the obstruction of his career if he did not fall in line. “Hosseini, you either take this money from us…or we use a tenth of this money to obstruct your success. Make your decision. You will set up the TV that will be publicized. Its system is available, and we will give you the news which is all critical [of the regime],” said Hosseini. Maryam Rajavi: Terrorism is the regime’s strategy to thwart its own overthrow, and all its leaders are involved. In a video conference of the gatherings of Iranian communities simultaneously held in 42 cities and capitals of Europe, North America and Australia on Saturday, December 15, Mrs. Maryam Rajavi addressed the Iranian communities taking part. 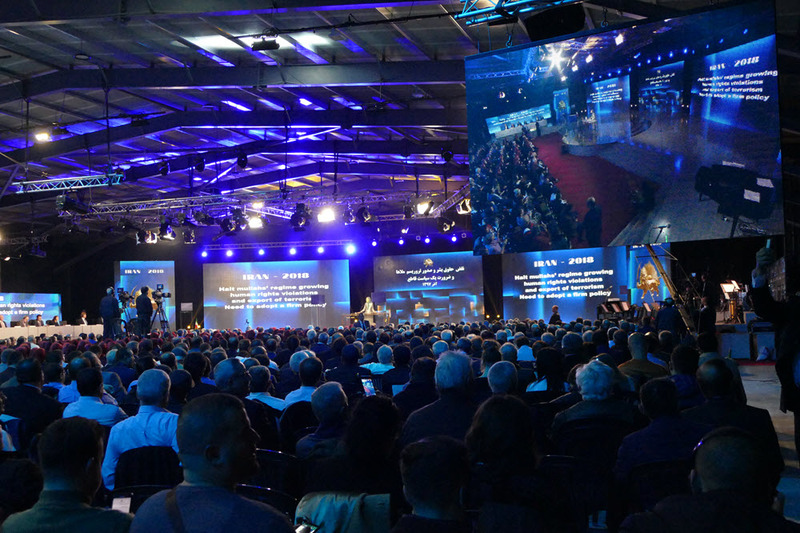 Speaking to the gathering of PMOI members in Ashraf 3 in Albania, Maryam Rajavi called for the adoption of a firm policy vis-à-vis the Iranian regime. In this speech which was being broadcast in the gatherings of Iranians in cities across the world, she stressed, “The IRGC, the MOIS, and the regime’s state propaganda machine must be placed on the U.S. List of Foreign Terrorist Organizations and the terror list of the European Union. The gatherings of Iranians were held simultaneously in 42 cities in Europe, North America and Australia including in Ashraf 3 (Albania); Brussels (Belgium); Ottawa, Toronto, Montreal, Vancouver, Winnipeg (Canada); Copenhagen, Arhus (Denmark); London, Liverpool, Bristol, Sheffield and Birmingham (U.K.); Helsinki, Turku (Finland); Paris (France); Berlin, Cologne, Stuttgart, Frankfurt (Germany); Rome (Italy); Luxembourg (Luxembourg); The Hague, Zwolle, Eindhoven (The Netherlands); Oslo, Kristiansand (Norway); Bucharest (Romania); Zurich (Switzerland); Stockholm, Gothenburg, Malmo, Boras, Solleftea (Sweden); Washington, D.C., Berkeley, Orange County, Atlanta, Dallas (U.S.); Vienna (Austria); and Sydney (Australia). Patrick Kennedy, former member of the House of Representatives (U.S.); Pandeli Majko, Minister of State for Diaspora and former Prime Minister (Albania), Fatmir Mediu, leader of the Republican Party and former Defense Minister (Albania); Syed Ahmad Ghozali, former Prime Minister of Algeria; Ingrid Betancourt, former presidential candidate (Columbia); Lord Navnit Dholakia, deputy leader of the Liberal Democratic Party (U.K.); Yves Bonnet, governor and former director of DST (France); Senator Gerry Horkan, deputy chair of the Financial Committee in the Senate of South Ireland; Antonio Tasso, member of Parliament (Italy); Peter Eide, member of the parliamentary judiciary committee (Norway); a number of other lawmakers, European elected representatives, as well as political, legal and religious personalities were among the participants and speakers in this conference. Dozens of representatives of more than 300 Iranian associations and communities in various countries spoke in this video conference which started at 3 p.m. local time in central Europe. They reiterated their support for the National Council of Resistance of Iran, the People’s Mojahedin Organization of Iran, and the Ten-Point Plan of the Iranian Resistance’s President-elect Maryam Rajavi. They said the only solution to the current crisis in Iran which has driven the entire region to the edge, is the overthrow of the clerical regime and the establishment of popular sovereignty and democracy. Declaring their readiness for lending all-out support for the PMOI and the resistance units inside Iran in the final phase of the clerical regime’s rule, they said, “The Iranian Resistance led by Mr. Massoud Rajavi, enjoys a broad social base of support in Iran, has a strong organization, offers a clear platform and has adopted progressive and democratic plans for future Iran. It is able to bring about regime change and is capable of transferring the sovereignty to people. They have unique capacities and potentials for rebuilding the future Iran, offer social justice, and returning hope and trust to a nation which has suffered numerous treasons over the past 100 years and has been viciously suppressed and discriminated against under the dictatorships of the shahs and the mullahs. They added that in line with the uprisings in Iran and the overthrow of the regime, they see it as part of their duty to reveal the schemes and conspiracies of the Ministry of Intelligence, the terrorist Quds Force, and other agencies of the clerical regime against the only democratic alternative to the clerical regime in Iran.